New Talent Books: "Barque Cats"
Re: New Talent Books: "Barque Cats"
We'd like to write more too, Jube, but apparently they didn't sell well enough to entice the publishers to buy more. Buncha dog lovers, I guess. I was trying to making a working ball of yarn, and had both of them trying to play with it. In fact Smokey look at the new ball, and I said I don't need it pick up by a cat! Paws said "woof, wrouf, woof" meaning that just because the majority here on this thread are going on about cats, doesn't mean you have to stop writing them? You can always self-publish, using Lulu like Hans did for the 40 years of Pern. At least you know that it will sell. Just one option. I'd like more of it. I have been thinking IF I can, get money transfer, I want to get it. Also see if I can have 'read' for some friends of mine, they are like I am fan of AMC and are blind and/or print disable. The only problem with doing that, Jube, is that it is a partnership and the business end of it is a bit complicated. I could ask Anne what she thinks. If it got done, I would need to do most of it. We do have another story to tell but it gets a little tricky legally to try to do it ourselves. I was hunt around from some else, and on a Amazon.com search for a cat related book by Mercedes Lackey, Skitty, four short stories its out via kindle and, just after it, Noble Warrior 1989 by Andre Norton, is in the hardback I've got. I haven't read any of these yet. As Mum to 6 inside cats -they have a cattery in the garden and an enclosed 20x 2m verandah on the west side of the house - it is a huge oversight. Off to check eBay! Plus there is also SPAM VS THE VAMPIRE! MRRROW! So far no questions but, then I'm slowing going over backlog of e-mails. Well, if you get it, hope you enjoy it. If Spam becomes an audiobook everyone will have to listen to me stumbling around reading it because there's no money for that sort of thing. What an attractive feline family, Analog6! How sad, 'meow' just had Reggie in here talking to me. As my dad used to say, "If only I were rich instead of just so damned good lookin'." On another topic altogether, for those of you in the US, do you know that as of the moment, Anne is planning to go to Dragoncon? Of course, it's all "health permitting" but she's really looking forward to it and wants to. Todd is a guest there as well so I imagine there will be some two-generations-of-Pern panels going on. Alas, I will not be able to make it but if any of you are, have fun! Nor am I, I just got the second one, in the set and shareed your link with a few other I know of. Please disregard my note about Annie and Dragoncon. She's been having some health problems that are going to prevent her from going. P'ter. I don't know any cats with nine tails actually. 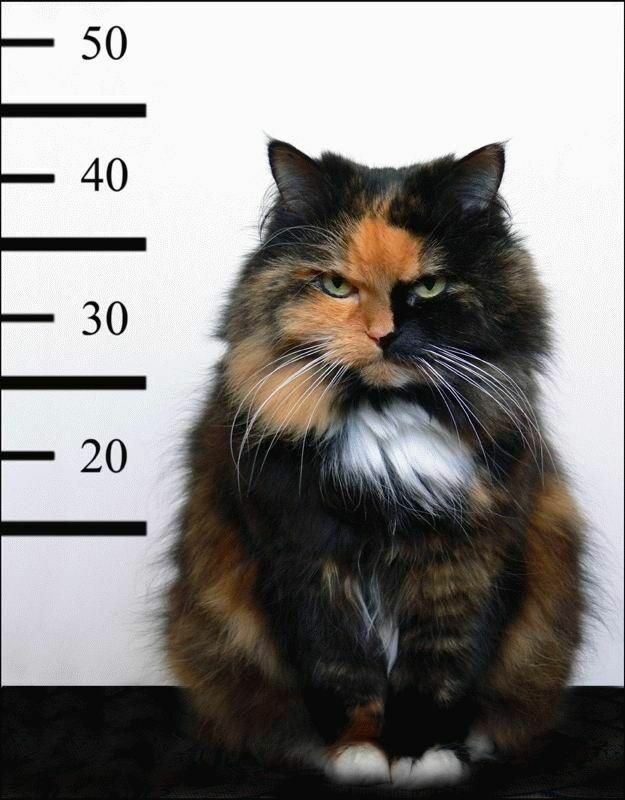 I was willing to let you off with one cat with one tail but if you're feeling ambitious, you do the math. I forget this kitty's real name but he is on UCats. He looks like I think Chester should look. You've certainly had the privilege of knowing some fine cats! I have to admit, when I think about the pregnant tricolor barque in one of the Tower books (blank on which) this is always the mental image I had for her. I definitely appreciated Catalyst and Catacombs more on a second read, after finding out the real reason why there were no obvious tiebacks.